Lasagna is a traditional Italian dish! 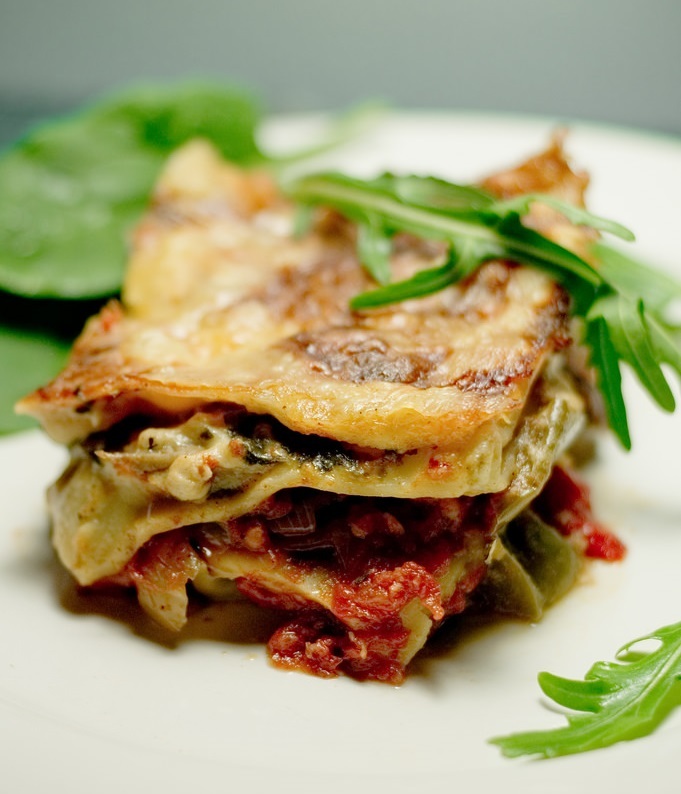 Incredibly delicious but extremely high in calories… If you are looking for a lighter version of lasagna, try out this vegetable lasagna recipe. Cook the lasagna noodles in salted (1-2 tsp) boiling water for 10 minutes. Rinse with cold water, drain, and let them dry on a plate for a few minutes. Get a large pan and warm it to medium heat, add vegetable oil (2 tbsp) and warm it over medium heat until simmering. Add pre-chopped zuccini, eggplants, bell peppers, onion, and salt. You can add some black pepper, stirring the vegetables for 7-10 minutes until the veggies become soft and the edges turn golden. Reduce heat, and simmer for 5 minutes (add 3-5 tbsp of water, if necessary). Remove the pan from the heat and set aside. To prepare tomato sauce, pour a can of diced tomatoes into a mesh sieve to drain off the excess juice. Then, transfer the drained tomatoes to the bowl of a food processor. Add vegetable oil (2 tsp), minced garlic cloves, salt, and ground black pepper. Pulse the mixture for about 8 times, until the tomatoes have broken down to a spreadable consistency. Pour the mixture into a bowl for later use (you should have around 2 cups of sauce). Evenly spread 1/2 cup of tomato sauce over the bottom of a greased baking dish. Layer lasagna noodles to cover the bottom of the dish. Then, layer half of the vegetable mix, top with 3/4 cup of tomato sauce, and sprinkle 1/2 cup of grated Mozzarella cheese on top. Top the bottom layer with lasagna noodles, followed by the remaining vegetable mix, 1/2 cup of tomato sauce, and evenly sprinkled 3/4 of grated Parmesan cheese. Top everything with another layer of lasagna noodles, and spread the remaining tomato sauce to evenly cover the noodles. Then, evenly sprinkle the last layer with the mix of remaining Mozzarella and Parmesan cheese. Cover the lasagna with a sheet of aluminium foil. Bake, covered, for 15-20 minutes. Then, remove the cover, rotate the pan by 180° and continue cooking for about 10 more minutes, until the top is turning golden brown. Turn off the oven and let the lasagna cool for 15 minutes before serving. The best part of the vegetable lasagna is that you can play with different combinations of vegetables but at the end it will still result in a delicious and nutrient rich lasagna. Alia has been doing sports since childhood: rhythmic gymnastics, tennis, synchronized swimming, and currently does Police Judo. 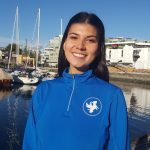 Being constantly active, learning about human anatomy and kinetics makes her happy so choosing Kinesiology as her academic and career goal is a perfect match!